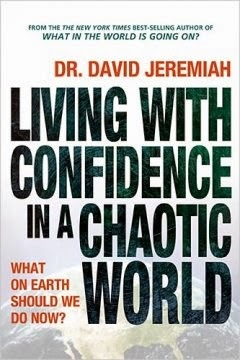 I've always been sort of cautiously enamored with Dr. David Jeremiah. I was part of a program at the church he preached at (Shadow Mountain Community Church), and was a member at their sister church for awhile. Yet despite knowing that this megachurch was nearby, and knowing about it's prolific preacher, I never really invested in Dr. Jeremiah's writing. That changed when I started researching the idea of the rapture in greater detail. Along with Tim LaHaye, Dr. Jeremiah is a major proponent of the rapture of the church, and so I turned to his book for information. The book was written in the midst of the economic meltdown, so I was a few years behind schedule in reviewing it. His introduction immediately equates the downturn in our economy, the high unemployment, the growing number of natural disasters, and the like to the labor pains that the Bible refers to happening just before the end of time. Then Jeremiah's first chapter tells us all to stay calm. Honestly, it's a great way to start the book. Set everyone up with reminders of the horrid issues going on and then remind them that the first mission is to be calm. Throughout his book, he suggests things that we ought to do as we see the world grow more chaotic. He mixes his factual and Biblical data with stories from people he has met or known. There is a particularly entertaining story early on in the book about Billy Graham's grandson and how it relates to John 14:6. With chapters like “Stay Constructive,” Stay Centered, Stay Confident, and Stay Connected, it becomes clear that Jeremiah believes that people must continue living a healthy, well-balanced life during trying times. It makes sense of course. If one buys in to his idea of prophecy, then you know we can't change God's plan. Therefore, we should simply live our lives in light of eternity, connecting to God and our fellows. Overall, the book was good, though I don't personally care for stories mixed in with the factual data. It just doesn't do it for me. However, he did handle the Word of God well, and showed how it related to the world around us. It's good enough that I'll refer to it often as I continue to research the end times. If the pains turn out to be Braxton-Hicks, will he write a corrigenda? On a more serious note, would you give us a timeline of future events as you see them? I won't hold you to it since the matter is under review, but it would be helpful to know where you are in your thinking. This may prevent miscommunication. Re LeHaye: I forced myself through the first Left Behind book. I will leave the review to you.